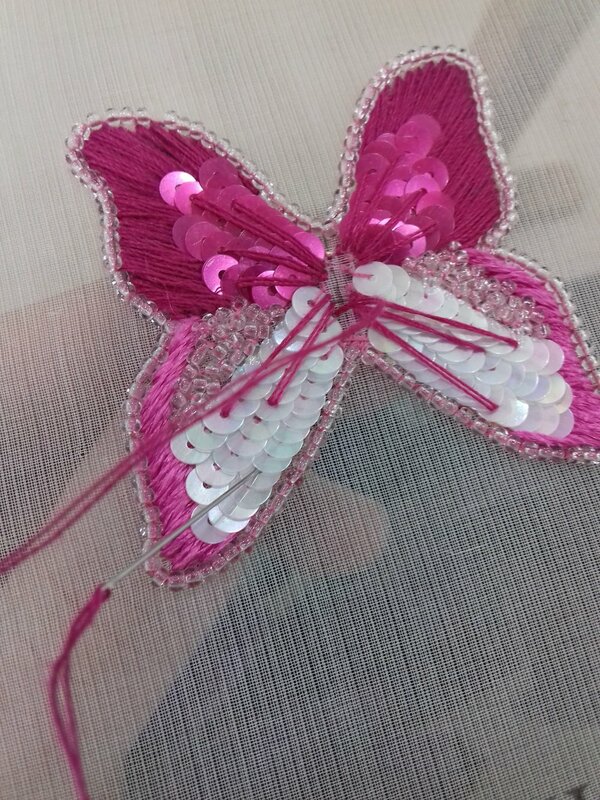 The teacher smiled reassuringly as she brought me to my work station in the atelier and gave me a neatly packaged parcel that contained the pattern and materials required to make a fuchsia pink butterfly brooch. This was set aside while the tambour embroidery frame was assembled. Using mortises, lattes, screws, twill-tape, pins and exacting measurements, the organza fabric was stretched tightly across the frame and I was ready to begin. With Lunéville crochet the pattern is upside-down on the frame and the hook is worked from the top of the fabric with one hand and the thread is worked from beneath the fabric by the other hand. The first technique was the basic chain stitch; looping the thread below the frame with my left hand to start and inserting the hook into the organza vertically with my right hand, catching the loop, rotating the hook and carefully pulling to the surface. Two tiny stitches to anchor thethread and then a small sampler to practise going up, down, left and right. By the end of the week I had cramps in my hands, my shoulders ached and my eyes stung, but it was worth it! I had learned the techniques of applying beads, sequins, jewels, vermicelli beads, satin stitch, and lancé stitch as well as countless tips and tricks to master the skills needed toprogress.